In the history of nineteenth-century religious thought, William Robertson Smith occupies an ambiguous position. More than any other writer, he stimulated the theories of religion later advanced by Frazer, Durkheim, and Freud. Smith himself was not an original scholar, but was rather ""clever at presenting other men's theories"" within new and sometimes hostile contexts. 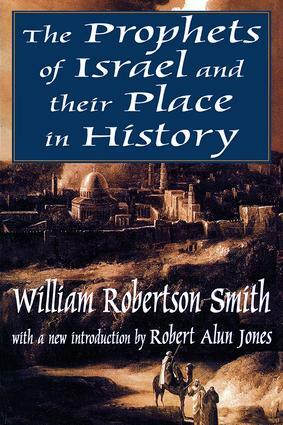 Smith was an important contributor to two of the most serious challenges to Christian orthodoxy of the last century, the ""Higher Criticism"" of the Bible and the comparative study of religion, and was also the victim of the last successful heresy trial in Great Britain. Yet he was an utterly devout Protestant, whose views on Biblical criticism (for which he was damned) are now considered as true as his views on totemism and sacrifice (for which he was praised) are now considered false. Despite Smith's enormous significance for the history of religious ideas, he has been written about relatively little, and most of what we know about his life and work comes from a source almost a century old. Originally published in 1882, The Prophets of Israel is a collection of eight lectures, including ""Israel and Jehovah;"" ""Jehovah and the Gods of the Nations,"" ""Amos and the House of Jehu,"" ""Hosea and the Fall of Ephraim,"" ""The Kingdom of Judah and the Beginnings of Isaiah's Work,"" ""The Earlier Prophesies of Isaiah,"" ""Isaiah and Micah in the Reign of Hezekiah,"" and ""The Deliverance from Assyria. ""A new introduction by Robert Alun Jones discusses Smith's early life, the heresy trial, Smith's early view of prophecy, and the classic text itself. The book will be of interest to students and teachers of religious studies, and general readers interested in Robertson Smith.